John Kofi Agyekum Kufuor (born 8 December 1938) is a retired Ghanaian politician and statesman who served as President of Ghana from 2001 to 2009. He was also Chairperson of the African Union from 2007 to 2008. His victory over John Atta Mills after the end of Jerry Rawlings' second term marked the first peaceful democratic transition of power in Ghana since independence in 1957. Kufuor's career has been spent on the liberal-democratic side of Ghanaian politics, in the parties descended from the United Gold Coast Convention and the United Party. He was a minister in Kofi Abrefa Busia's Progress Party government during Ghana's Second Republic, and a Popular Front Party opposition frontbencher during the Third Republic. In the Fourth Republic he stood as the New Patriotic Party's candidate at the 1996 election, and then led it to victory in 2000 and 2004. Having served two terms, in 2008 he was no longer eligible for the presidency. An Asante, Kufuor married Theresa Kufuor (née Mensah) in 1962; they had five children together. Kufuor and his family belong to the Roman Catholic Church. He was born in Kumasi and educated at Osei Tutu Boys college (1951–53), Prempeh College (1954–58), Lincoln's Inn, London (1959–1961) and Exeter College, University of Oxford (1961–64). In the Second Republic's Parliamentary Register Kufuor lists as his hobbies and interests table tennis, reading, football, and film shows. He was once the Chairman of Kumasi Asante Kotoko Football Club. Kufuor served as the Member of Parliament for Atwima Nwabiagya in the Second (1969-72) and Third (1979-81) Republics. As a Secretary for Local Government, he wrote the Local Government Policy Guidelines that were to be the foundation of the current decentralized District Assemblies. On 20 April 1996 Kufuor was nominated by 1034 out of 2000 delegates of the New Patriotic Party (NPP) drawn from all the 200 Constituencies of the Country to run for the President of Ghana on 10 December 1996. After campaigning for less than nine months, Kufuor polled 39.62% of the popular votes to Rawlings' 57% in the 1996 election. On 23 October 1998 he was re-nominated by the New Patriotic Party not only to run again for President but also to officially assume the position of Leader of the Party. Kufuor won the presidential election of December 2000; in the first round, held on 7 December, Kufuor came in first place with 48.4%, while John Atta-Mills, Jerry Rawlings' Vice President, came in second with 44.8%, forcing the two into a run-off vote. In the second round, held on 28 December, Kufuor was victorious, taking 56.9% of the vote. When Kufuor was sworn in on 7 January 2001, it marked the first time in Ghana's history that an incumbent government had peacefully surrendered power to the opposition. His administration's domestic policy in the first term was marked by fiscal and monetary stringency on the economic front, aimed at stabilizing a national economy that had stagnated and was in decline. His social vision was focused on unleashing the entrepreneurial, creative and innovative potential of Ghanaians as a means of creating wealth and hence dealing with the social challenges facing them. This socio-economic vision was encapsulated in the Five Priority Areas Programme, viz., the pursuit of good governance, modernization of agriculture for rural development, private sector participation, enhanced social services and vigorous infrastructure development. His administration is said to have received the most financial assistance of any in the history of Ghana, due essentially to donors' distrust for the military governments before it, as well as those with some military connections. Kufuor's foreign policy was underpinned by what he termed "economic diplomacy". It is within this context that in Africa in general and in West Africa in particular, a good neighbor policy has been pursued, which saw Ghana under Kufuor brokering peace in Liberia, Sierra Leone, Ivory Coast and Guinea-Bissau, among other African states. On the global stage, Kufuor actively sought the establishment of a just and equitable international social and economic order, while promoting and safeguarding the interests of Ghana through bilateral and multilateral agreements. His stature as statesman, democrat and credible spokesman for Africa found expression in his invitation to major international meetings and conferences including the founding summit of the AU, G8 Summits in Sea Island, Georgia and Glenneagles, Scotland, and the World Economic Forum. He served as Chairman of the regional grouping ECOWAS for two consecutive terms – 2003 and 2004. In 2007, due to the policy successes his administration chalked up, Kufuor had his mandate renewed in 2004 and was sworn into office on 7 January 2005. Policy direction in Kufuor's second presidential term built on the foundations laid in the first four years. The administration pursued Ghana's socio-economic transformation in the second term, using the three-pronged approach of private-sector development, human resource development and good governance. At the international level, Kufuor consolidated Ghana's position as the voice of Africa, credible peace broker, beacon of democracy (Ghana was the first country to undergo Peer Review under NEPAD's Africa Peer Review Mechanism) and responsible member of the comity of nations. On 29 January 2007, Kufuor was elected as Chairperson of the African Union for the 2007–08 AU session. He was succeeded by Jakaya Kikwete of Tanzania on 31 January 2008. Kufuor was involved in a car accident during his presidency on 14 November 2007, in which another car collided with his, causing it to roll over several times. Kufuor was reported to be uninjured. He started the National Health Insurance Scheme to replace the existent cash-and-carry system; 11 million Ghanaians were registered under this scheme. He set up the National Ambulance Service and built more than 205 hospitals and clinics. He also built a state-of-the-art emergency centre at the Komfo Anokye Teaching Hospital. Kufuor also introduced free maternal health care in public hospitals for all expectant mothers. Kufuor institutionalized the capitation grant for school children at the basic level, whereby each student was entitled to $2 for cultural sports and development. He also started the national school feeding programme. He changed the Senior Secondary School curriculum from three years to four years and renamed it Senior High School. He started the model school senior high school concept in which some deprived schools were upgraded to the level of some first-class senior high schools. Kufuor launched the Microfinance and small loans program (MASLOC) – a US$50 million fund that makes micro loans available to the productive population – and introduced the Livelihood Empowerment Against Poverty Program (LEAP), which provides direct cash transfers to poor households in the country who could not support themselves. For the first time in Ghana's history, borrowing became so cheap and available that microfinance companies (and major banks) actually went on to the streets to encourage small-scale businessmen and women to apply for loans. He renovated the Accra Sports Stadium and the Baba Yara stadia as well as built the Essipong and Tamale stadia in 2008 to host the CAN 2008. Under Kufuor Ghana qualified for the World Cup in 2006. Finally, President Kufuor's good governance policy has led to Ghana obtaining a record $500 million grant from the U.S Millennium Challenge Account for economic development. Social vision was anchored on unleashing the entrepreneurial, creative and innovative potential of Ghanaians as a means of creating wealth and hence dealing with the social challenges facing Ghanaians. This socio-economic vision was encapsulated in the Five Priority Areas Programme vis the pursuit of good governance, modernization of agriculture for rural development, private sector participation, enhanced social services and vigorous infrastructural development. The George Walker Bush Highway was also built from this fund. Kufuor has been honored with numerous awards, including the Face-of-Good-Governance Award, Chatham House Prize, the Climate Change Award, and the World Food Program’s Global Ambassador Against Hunger. Kufuor has five children with his wife, Theresa Kufuor. An Akan, Kufuor speaks the Akan language fluently. He was known for using his language whenever he was campaigning in his native Ashanti Region. Kufuor lives in Accra, capital city of Ghana. In July 2009, Kufuor became a member of the SNV Netherlands Development Organisation International Advisory Board to contribute his expertise to the organisation's poverty reduction work. In September 2009, Kufuor spoke in the Netherlands at a Dutch government event to mark '60 years of development aid' at the invitation of Dutch Minister Bert Koenders, which was attended by nearly 2,000 people. During his visit to the Netherlands, he was interviewed by the newspaper NRC Handelsblad and the Internationale Samenwerking magazine. He argued for the importance of effective development assistance, pointing out that development aid helped Ghana enter the international capital market. On 21 September 2009, he delivered the prestigious Legatum Pericles Lecture at the Legatum Center for Development and Entrepreneurship at the Massachusetts Institute of Technology. Kufuor is the Governing Council Chairman of Interpeace, an international peacebuilding organization based in Geneva since October 2009. Kufuor was chosen together with Luiz Inácio Lula da Silva to jointly receive the 2011 World Food Prize for their personal commitment and visionary leadership while serving as the presidents of Ghana and of Brazil, respectively, in creating and implementing government policies to alleviate hunger and poverty in their countries. The foundation in a statement said the significant achievements of these two Laureates illustrate that transformational leadership truly can effect positive change and greatly improve people’s lives. On 20 September 2011, Kufuor inaugurated the John Agyekum Kufuor (JAK) Foundation with a ground-breaking ceremony for the JAK Centre for Leadership, Governance and Development at the University of Ghana, Legon. The inaugural lecture, which attracted very high local and foreign dignitaries, had H.E. Horst Köhler, former president of Germany, as its guest speaker. 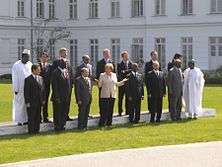 Thabo Mbeki, former president of South Africa, and Ghana ex-president Jerry John Rawlings, Kufuor's fiercest critic, were among the dignitaries who attended the ceremony. The ex-presidents also unveiled a plaque on 22 September 2011 for the Kufuor Presidential Library and Museum at Kwame Nkrumah University of Science and Technology (KNUST), Kumasi, which formed part of the John A. Kufuor Foundation. Numerous NPP supporters tried to barricade President Kufuor's house on 7 January 2013 to prevent him from attending John Dramani Mahama's inauguration, which the NPP as a party had decided to boycott as they felt going would undermine their challenge to Mahama's win in court. Kufuor explained that the party had allowed him to go because he was invited as an ex-President of Ghana and not as a Member of the NPP to the chagrin of the supporters. The Ghana Police Service (GPS) reinforcement had to be sent to his abode to allow him to be able to go for the programme. ↑ "Elections in Ghana". Africanelections.tripod.com. Archived from the original on 30 May 2012. Retrieved 14 May 2012. ↑ "Kikwete is new AU chairman". IOL. Reuters. 31 January 2008. Archived from the original on 8 December 2008. ↑ "Ghana's president involved in a car crash". IOL. Reuters. 14 November 2007. Archived from the original on 8 December 2008. ↑ "Health Insurance in Ghana". Ghana Web. Archived from the original on 4 August 2013. Retrieved 26 July 2013. ↑ Sebastian R. Freiku (9 June 2008). "KATH, Accident, Emergency Centre takes shape". Ghanian Chronicle. Kumasi: Modern Ghana. Archived from the original on 22 October 2013. Retrieved 26 July 2013. ↑ "Kufuor inaugurates model School at Praso". 13 May 2008. Archived from the original on 28 September 2013. Retrieved 26 July 2013. ↑ News "N1 highway named after George Bush" Check |url= value (help). Modern Ghana. 15 February 2012. Archived from the original on 7 May 2013. Retrieved 26 July 2013. ↑ "Africa still needs aid -Kufuor". Ghanaweb.com. 29 September 2009. Archived from the original on 27 September 2012. Retrieved 14 May 2012. ↑ President Kufuor Archived October 17, 2009, at the Wayback Machine. 1 2 "The 2011 World Food Prize Laureates". World Food Prize. Archived from the original on 19 July 2011. Retrieved 22 September 2011. ↑ "I am happy to see you Rawlings – says Kufuor". Myjoyonline. Archived from the original on 23 September 2011. Retrieved 22 September 2011. ↑ "Sanitation and Water for All at Stockholm World Water Week 2013". Sanitation and Water for All (SWA). 15 October 2011. Archived from the original on April 9, 2014. Retrieved 9 February 2012. ↑ "NPP supporters besiege Kufuor's residence - To stop him from attending Mahama's inauguration". 7 January 2013. Archived from the original on 10 March 2013. Retrieved January 11, 2013. 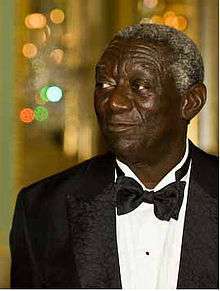 Wikimedia Commons has media related to John Kufuor.